At Patches4Less.com, custom patches are ALL we do. We’re your one-stop, no-problem source if you need custom patches for sports teams, businesses, military units, motorcycle clubs and events, camping, Scouting, martial arts or any other purpose. Our custom patches are perfect for uniforms, duffle bags, jackets or any other use. We supply top quality patches at great prices, with unbeatable customer service! Custom Embroidered and Iron On Patches are all we do. Here at Patches4Less, the quality of the embroidery of your custom patches and our customer’s satisfaction are our top concern. We are your Number One Source for all types of patches. From Military Patches, Police Patches, Fire Department Patches, Security Service Patches to everything in between; We are here to make the process of ordering your custom patches as easy and enjoyable as possible. Custom Patches are as easy as 1-2-3! Custom embroidered patches provides a high-quality look without the high cost. In addition, you get the flexibility of adding your customized design to any article of clothing regardless of size, shape, or fabric. Plus, our easy, Three Step order process makes it a breeze for you to get your custom patches. Patches4Less is your Number One source for any and all patches! With hundreds of different styles, colors, and attachment options, we know you’ll find exactly what you’re looking for. We make your buying experience quick and easy. Our design team has years of experience and thousands of orders under their collective belt. We’ll use that experience to design some great-looking custom patches to your exact specifications! Custom embroidered patches and iron-on patches developed exactly to your group’s design specifications are all we do. 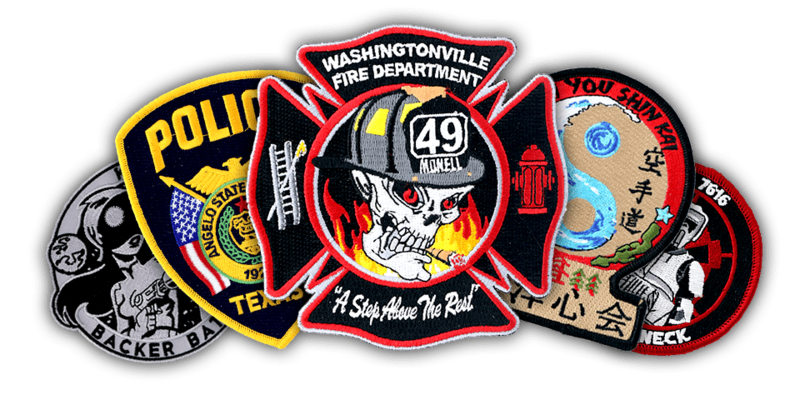 With experience manufacturing millions of custom embroidered patches ranging from Scout groups of all kinds, camping patches, fireman patches, police patches, EMT patches, and military patches, to corporate patches for Fortune 500 companies. When it comes time to create a patch for your team, organization or company, patch design shouldn’t be something you dread. Just send us a picture of your logo, existing patch or any idea that you would like to see transformed into a custom embroidered patch! We accept design images in any PC format. You can even e-mail us a sketch or drawing of your desired design. No matter what your patch needs are, we can handle it! We offer a full range of sizes, custom shapes, border types, thread colors and attachment methods. Just let us know what you need and our great team of graphic artists will make it happen. It really is that easy at Patches4Less. We make ordering custom patches easy, fast and fun!